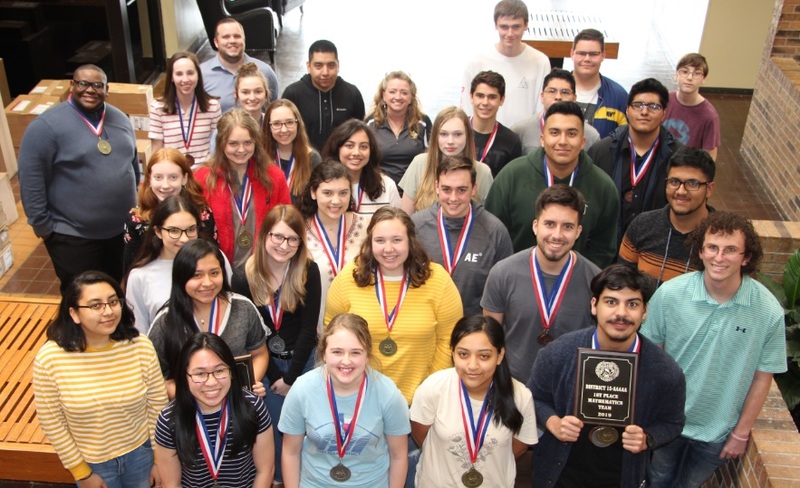 The Mount Pleasant High School UIL Academic team was at the District 15 AAAAA UIL Academic Meet on March 28-29 at Sulphur Springs High School. The UIL Speech and Debate team attended competition a few days later on April 4 at Region 8. Overall, three full teams and several individuals have advanced to the Regional Meet. In Mathematics, the team placed 1st overall and will send all members to Regionals. The team swept the top 4 medals with Jose Liera placing 1st, David Barboza 2nd, Shelby Courreges 3rd, and Miguel Segura 4th. The Calculator Applications team also placed 1st overall, sending all of its members to Regionals. Individually, Liera was 1st, Barboza 2nd, Patricia Roque 4th, and Samip Poudel 5th. In Number Sense, Segura placed 2nd personally and qualified for Regionals in that event. The Spelling team of Anna Harris, Rocio Hernandez, Annie Le, and Taryn Thurman placed 2nd overall and will advance to Regionals as the wildcard team. Hernandez was the District Champion placing 1st individually with Le placing 6th. In Journalism, Rebecca Yox placed 2nd, and Taryn Thurman placed 3rd in Copy Editing, qualifying them for the Regional Meet. Yox also qualified for Regionals in Editorial Writing with her 2nd place finish. She placed 5th in News Writing and 6th in Headlines. In Science, Liera claimed the District Championship and will advance to Regionals in that event. The team of Liera, Sam Pearson, Samip Poudel, Johnathan Segari, David Barboza, and Brock Shavers placed 2nd as a team. In Current Events, Javier Martinez placed 3rd and will advance to Regionals. Audrey Courreges placed 4th. The team of Courreges, Martinez, Isabella Greco, and Ryan Sharp placed 2nd, but narrowly missed advancing to Regionals as the wildcard team. In Speech and Debate, Caroline Rose claimed the District Championship with Reid Pinckard placing 2nd and Kylie Hedge placing 6th in Lincoln Douglas Debate. Rose and Pinckard will advance to Regionals. In Poetry, Ja’Quacy Minter claimed the District Championship for the 2nd year in a row and will advance to Regionals while Mackenzie Lide placed 6th. In Persuasive Extemporaneous Speaking, Audrey Courreges placed 2nd, and Pinckard placed 3rd, advancing both of them to the Regional Meet. Isabella Greco set 4th and is the alternate to Regionals. In Informative Extemporaneous Speaking, Connelly Cowan placed 3rd and will advance to Regionals. Taylor Hubbs placed 4th and is the alternate while Ryan Sharp came in 5th. Sharp also placed 5th in Prose. Also at the Academic District meet, Blanca Antolin placed 4th in Computer Applications, Nick Segovia placed 4th in Accounting, and Ezequiel Salazar placed 4th in Social Studies and 6th in Ready Writing. Advancing teams and individuals will compete at the Regional Meet on April 12-13 in Prosper. Those placing in the top 3 in each event will qualify for the State Meet in May.